New to DXing? Wonder what it is? This guide will tell you all there is to know about the hobby, focusing on DXing the FM radio band. Disclaimer: There are no set rules for DXing. I’m in no way proposing that I’m an authority on the hobby. This guide is solely based on my experience as a DXer and what I feel is important for others to know about DXing. This guide is based on DXing in the United States. 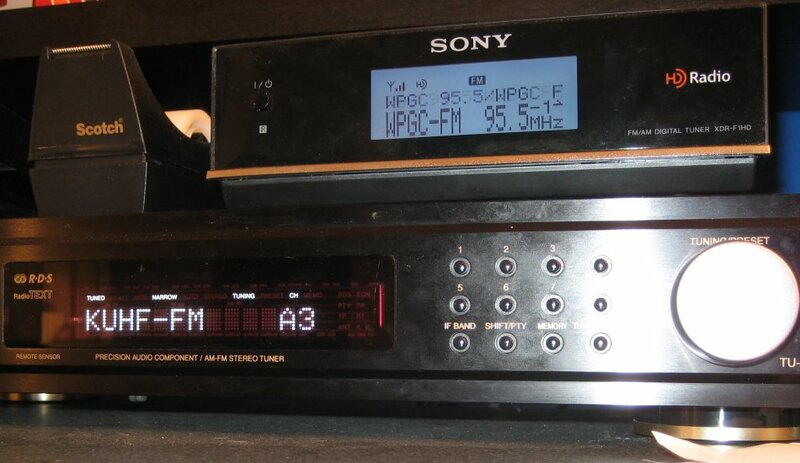 My radios simultaneously receiving FM stations from Maryland (WPGC) via groundwave and Texas (KUHF) via e-skip in 2008. Witnessing a DXer in action can be strange, even borderline bizarre to someone not familiar with the hobby. Imagine someone listening to a staticy radio station on purpose, ignoring other FM stations with a much stronger, stereo signal. To a DXer, they don’t care about the music that is playing–they are listening to that weak station to find out where it is coming from. DXing is the logging of distant signals. It is entirely possible to pick up an FM station 500-1500 miles away with rabbit ears indoors, or in a car. A DXer in Nebraska can pick up a radio station in Florida, while someone in Louisiana may hear an FM station from central America. Located 19 miles southwest of Washington, DC, I’ve received FM signals from as far away as New Mexico, Bermuda, Prince Edward Island and Manitoba. The quest to identify an unfamiliar signal is typically the only thing needed to keep DXers returning to their radios. The dial is always changing. This interesting hobby does seem to have a strange name. From what I’ve seen on various websites, the term “DX” itself stands for distance, much like “TX” and “WX” have been used as abbreviations for traffic and weather, respectively, in the broadcasting industry. Ham Radio is also another niche of the DXing hobby. In fact, any broadcast band can be DXed, including everything from shortwave to airplane/air traffic control frequencies. This website focuses on the three bands I regularly DX: FM, AM, and TV. 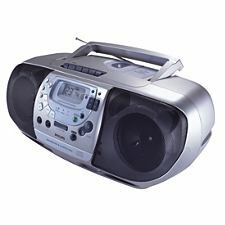 I used the Philips AZ1518 indoor radio from 1999-2003. Image credit: Philips. Many DXers, including myself, stumbled upon the hobby by accident. One morning in spring 1999, I came across an unfamiliar, but very strong stereo station on 104.5 FM. Knowing no station in the local Washington, DC region broadcasted on that frequency (this was before nearby 104.5 WGRX signed on), I kept listening. I soon realized I was picking up 104.5 WNVZ out of Norfolk, VA at 123 miles away. I scanned the dial to find unfamiliar regional VA/NC signals coming in. I was amazed, and the DX bug bit me. Since that day, I have logged almost 1900 FM stations from 6 countries. To become an FM DXer, you obviously need a radio. However, you don’t need expensive, professional equipment to DX. From 1999 to 2003, I used a run-of-the-mill Philips AZ1518 boombox indoors (pictured left) with its supplied whip antenna. I received FM signals up to 530 miles away while on vacation just using a wire antenna on the floor with another radio in 2012. Getting great reception with minimal investment is definitely possible. But having a dedicated FM tuner and a rooftop antenna is recommended, if possible, to get the best results and to be able to perform the advanced techniques further down on this page. If you are high in elevation, you may be able to get great DX using rabbit ears indoors, like I currently do. Many DXers consider the Sony XDR-F1HD radio and its clones (XDR-S3HD and XDR-S10HDiP) to be one of the best modern radios available due to its sensitivity, selectivity, and ability to decode HD Radio and RDS signals. Unfortunately, the XDR-F1HD, which was released in 2008 for $99, has been discontinued for years, and used models on eBay can often be more than $300. You can get the clones of the F1HD in good condition for under $100. I highly suggest doing so if you want a solid radio. Nowadays, you don’t even need an actual radio to DX. SDR, or software-defined radios, can often rival even the XDR-F1HD, allowing you to record 8 MHz (or more) of FM at the same time, allowing you to go “back in time” and DX every frequency within the recorded 8 MHz as if it was live, including decoding RDS. Think of it this way: you could record 88.1 FM to 96.1 FM at the same time, and you could go back and listen to 94.3 FM and 91.5 FM. This is invaluable during strong DX openings. 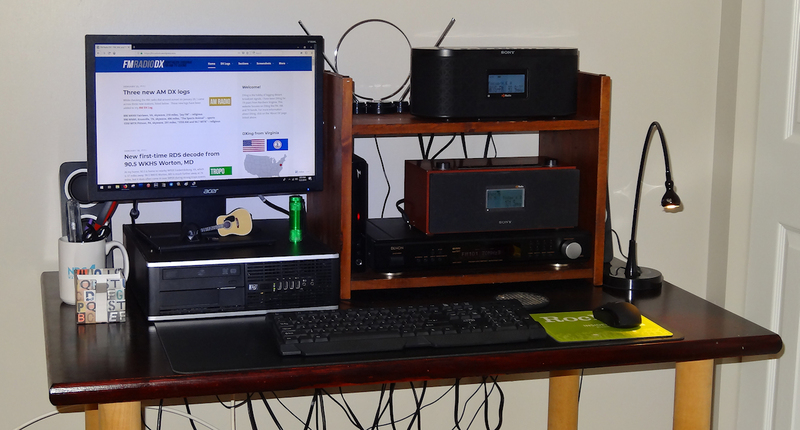 My main DX shack as of 1/21/19. Click to enlarge. A shack is a slang term in the DXing community for a place that holds all of your radios. Although it doesn’t need to be anything fancy, you do need a spot that has good reception to put your radios. Many people keep their radios on their desk. I actually use two shacks, one in my upstairs loft, and a second in my downstairs office, given both have differing reception to the point where I would be missing out if I only utilized radios in one room. As they say–the more, the merrier! By now, you probably understand that the crux of the hobby is to identify as many unfamiliar, new stations as possible. To succeed in the hobby, you need to become an expert on your local radio dial. To do that, you will need to keep records of every FM station you receive, otherwise known as a DX log. My paper DX log. Click to enlarge. To get an idea of what a DX log is, I suggest you to browse my logs. It may look intimidating at first, but a DX log is anything but that. Some DXers keep highly-detailed electronic logs, typically in Excel, Word or HTML formats. 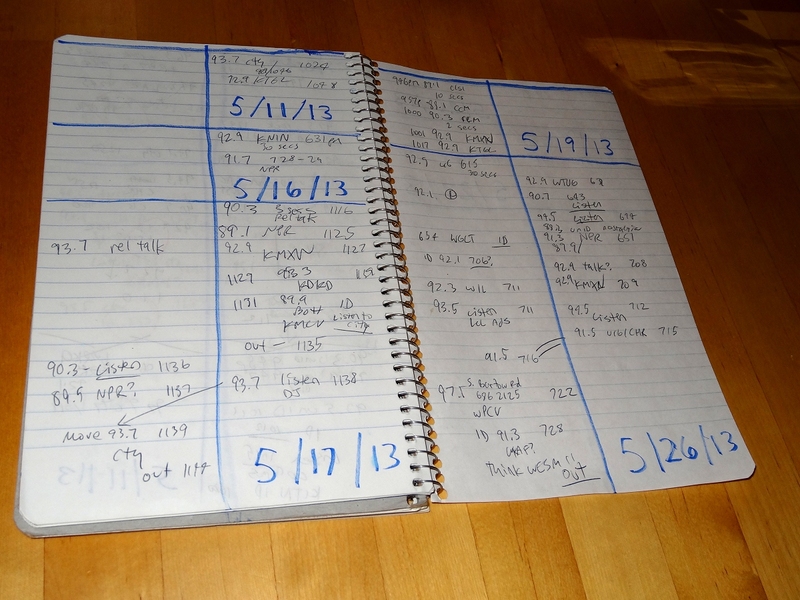 Others keep written DX logs instead. Personally, I use both paper and electronic logs. The Excel log, which can be viewed here and seen in the image to the right, is the final product which I present to the DXing community and use for reference when DXing. The paper log, seen to the left, is used during intense DX openings. I simultaneously record audio of DX openings and sync my notes to the recordings to help positively ID signals. More on recording DX is below. Regardless of the case, I suggest you, for every FM signal received, list at least the station’s frequency, call letters, city of license, mileage from your radio to the station transmitter, date and time received and any identifying notes (such as format, station name heard, website mention, etc.) Further down on this page, I’ll explain how to identify FM stations, calculate mileage and get the information needed for a DX log. The first few dozen radio stations in your log will typically be your local FM signals. A great way to get a printable list of stations that are typically found in any area is to visit Radio-Locator. Try your best to memorize the frequencies, station names and formats, because this is imperative to know when signal conditions are abnormal! I suggest monitoring the FM band at all times of the day, as DX can pop up unexpectedly. There are many ways of receiving FM stations. I’m going to focus on the top four propagation modes DXers are likely to encounter. Groundwave (Gw): Stations heard by groundwave are your local radio and TV stations, which are heard more-or-less all of the time regardless of reception conditions. In Virginia, these stations are usually 0-70 miles away. Signals heard via groundwave are strong and usually have complete RDS and HD Radio (assuming stations run either service). Click above to hear a groundwave signal from 93.3 WFLS Fredericksburg, VA at 26 miles. Tropo (Tr): This method of DXing brings in stations from nearby towns. Tropo is typically reliant on local weather conditions and occurs in the warmer months. High pressure systems are usually the basis for good DX reception. Stalled weather fronts and other phenomenon may produce stellar tropo ‘ducts,’ which could bring in stations up to 1000 miles away while excluding closer signals on the same frequency. Locally, these ducts typically bottom out at 420 miles, usually only in the 120-250 mile range. Signals received via this method vary from strong (like locals) to very weak and hard to listen to. It definitely helps to have good equipment so you can receive as many stations as possible. Click above to hear a tropo signal from 95.1 WNKS Charlotte, NC at 313 miles. DXers are typically limited by the surrounding terrain for tropo reception. Locally, I have mountains 60 miles to the N, NW and SW, as well as an ocean to 116 miles to the east—both of which effectively blocks further reception in those directions. Instead, I typically get tropo signals from the NE, E, S and SE. 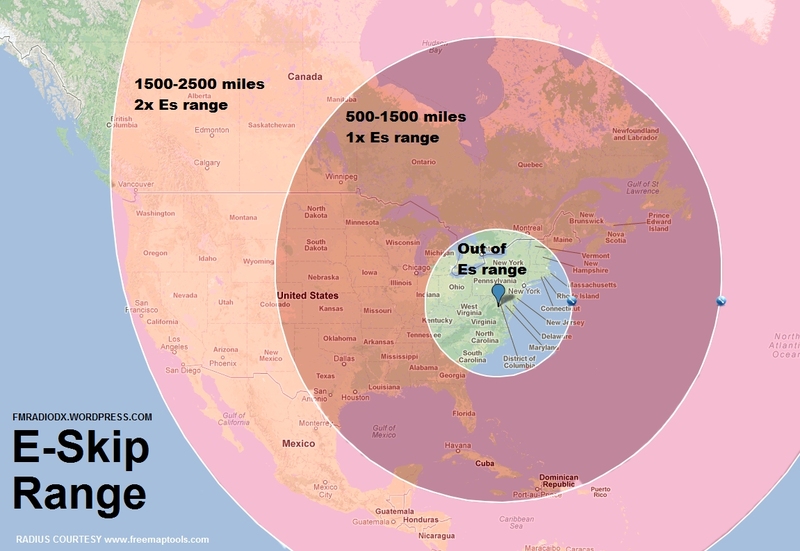 Other DXers in regions where there are no mountains, such as the Midwest, should more or less experience an equal ‘range’ of tropo in all directions. Those who live within 0-10 miles from an ocean are known to pick up tropo stations up to 1000 miles away at times, given how the water reflects signals close to the coastline. Sporadic E-Skip (Es): I consider this the ‘holy grail’ for DXing. After over 70 years of research, it is still unknown how Es happens. Common research suggests a ‘cloud’ of ionization in the E-layer of the atmosphere acts like a mirror to reflect signals back to the earth with distances of 500-1500 miles away, often with clear local-like reception. Stations received by Es , although strong, are typically characterized by having rapid fading, sudden dropouts, or are mixed in with other signals. Sporadic E openings tend to pop up in the late morning (9 a.m. to noon) and early evening (5-9 p.m.) hours in the warmer months but can happen at any time or day of the year. Click above to hear an E-skip signal received in Virginia from 100.7 KBZI Deerfield, MO at 946 mles. Note the rapid fading in the audio. Sporadic E-Skip is not affected by terrain limitations like Tropo, as Es is supposedly bounced off of the atmosphere, high above the mountains and other roadblocks. Es typically occurs between May and August, with peaks during the months of June and July. Local weather typically has no bearing on the occurrence of Es. Although this isn’t always the case, I have heard several Es openings where the distant stations I’m getting are under a severe weather watch. A new DXer may wonder what they can get via E-skip. It is impossible to know beforehand exactly what signals you may receive via Es, but you can get an idea of what to expect. The map to the right shows my effective Es range from Virginia. Stations located in the dark pink zone, or 500-1500 miles away, are typically what would come in via Es. For example, I have received many openings into Texas, Florida and Minnesota from my home in Virginia. Although half of my range is in Canada, I don’t get their signals as often due to a lack of signals and population. Stations 0-500 miles away are usually too close to be received by Es. But expect the unexpected–I’ve received TV Es at 463 miles and FM stations at 1505 miles away, so the 500-1500 Es range is not arbitrary. Es openings can last for many hours and can cover a wide area. For example, a DXer based in eastern Nebraska could log Florida FM signals at the beginning of the opening, and by the opening’s end, they are getting Maine FMs, all while getting stations from states in-between throughout the opening. It seems most Es openings I’ve encountered go north during the opening and the station selection changes accordingly. An interesting phenomenon of Es is that the selection of signals you get is almost always different. For example, one day I may get an opening into Tampa, Miami and Cuba, while the following day I get Dallas, Houston and Shreveport FMs. The next day I could be getting Quebec and Newfoundland stations. It is entirely possible to have two Es openings out there at once. One time, I was getting Nova Scotia and Newfoundland stations from NE Canada while at the same time getting signals from Oklahoma and Kansas from a separate Es cloud. Es is typically bi-directional, in other words if you are receiving stations from one geographical area, DXers in that locale are likely receiving signals from your region via Es, too. One day, I was getting FM Es from stations in the Houston, TX area while in Northern Virginia. At the same time, a friend of mine who lives in Houston picked up 94.5 WRVQ Richmond, VA, 77 miles away from my home. It is entirely possible to have Es signals ‘reflected’ by a second cloud, if two are existing at the same time, to allow a theoretical Es range of 2500 miles (combining the ‘range’ of both Es clouds). For example, in 2012, DXer Nick Langan received 92.9 KAFF from Flagstaff, AZ at roughly 2030 miles at his home in Florence, NJ. However, this is extremely rare. Es openings always start at a low frequency and work their way up. For FM DXers, Es starts to appear at 88.1 MHz (or a close-by frequency depending on local signals) and works its way up to the top (107.9 MHz), depending on opening strength. The MUF, or maximum usable frequency, of an Es opening is the highest frequency that can be received from a distant area at one time. For example, if you are getting Es signals from 88.1 to 100.7 FM, but you aren’t getting anything distant above 100.7, then 100.7 is the opening’s MUF. If you are getting signals from a sparsely-populated area, you may only find Es signals in the mid-FM band but nothing in the lower band, so I suggest checking the whole FM dial at all times when you believe Es may happen. The MUF doesn’t always go as high as 107.9 MHz, and it can change rapidly during the course of an opening. I highly suggest monitoring the TV/FM Skip Log during the warmer months as many DXers report Es openings as they occur. Keeping a radio on an empty low-band (88.1 to 92.9 MHz) frequency is also a great way to check for Es because you’ll start to hear music or talking fade in on that frequency when Es starts. Or, if you monitor amateur radio below 88.1 MHz and see Es, FM Es is likely also happening, or will soon as the MUF increases. Es is very finicky. I’ve noticed DXers in NJ, MA and even 90 miles away in MD sometimes Es up to 107.9 MHz while I get nothing, or minimal Es. Don’t be discouraged if regional DXers are getting top-of-the band Es and you aren’t. You may get it soon, if not on another day when they are getting nothing. Meteor/Airplane Scatter (Ms): Radio signals can also be received off of meteors and airplanes in the sky. This method of propagation is unique from tropo and Es, since it is almost impossible to actively look for meteor scatter. Signals propagated by Ms are usually very strong, and they can pop up suddenly on a clear, quiet frequency with distances of roughly 300-800 miles away, give or take a few hundred miles. The average length of Ms signals are 1-5 seconds, and the signals are the most common during major meteor showers. Almost all of my Ms signals were received via unattended recordings. The best way to DX Ms is to park your radio on an empty frequency and let your computer record your radio when you are not DXing. Click above to hear a meteor scatter signal from 98.1 WXMX Millington, TN at 734 miles. Note the abruptness of the signal. Many signals received by Ms are ‘duds,’ or are random pieces of music or other content which is impossible to identify which station it was coming from. It is a special occasion when the Ms ‘ping’ comes in right as the station IDs itself, such as in the WXMX clip above. Now that you know how to DX and understand how distant signals can come to you, it is important to know how to distinguish between different signals and identify radio stations. I consider this to be the most challenging part of the hobby, however the ‘hunt’ of trying to ID a radio station is fun and addicting! Legal ID: The easiest way to identify a signal is to listen to its legal ID, which U.S. stations are supposed to broadcast within 10 minutes before and after the top of the hour. In the clip above, you hear a legal ID from 94.5 WRVQ in Richmond, VA. If you hear this, then it is a slam-dunk ID. Log it in your DX log, and move on. Liner: Instead, you may only hear a station name or slogan instead of a legal ID. Above, you will hear a liner from 105.5 KMOM Roscoe, SD, “Dakota 105.5” received by Es. A simple Google search of “Dakota 105.5” comes up with listings of KMOM. This is a definite positive log of the station. Network ID: Sometimes, you could get a station that is part of a radio network, such as a statewide National Public Radio affiliate group, or, more commonly, a religious station network, such as AFR or Air 1. In the audio player above, I received a signal on 89.3 MHz IDing as “NET Radio.” After consulting their list of affiliates, I realized their only 89.3 FM is KXNE Norfolk, NE. Since no other radio station on 89.3 can (legally) identify as NET Radio, this is a positive ID of KXNE. Commercials: Don’t skip past DX signals airing commercial breaks! This is often an easy way to ID a station, as heard in the clip above from 102.3 KQEW Fordyce, AR. Note the mention of ‘Fordyce’ in the first ad, while the second ad is for the Bradley County Farmer’s Association in Arkansas. Using this information, I would positively conclude that the only station in SW AR that would run a Fordyce, AR commercial would be KQEW, and log the station. This may take a little work in Google to track down an address or business name, but stations typically only air (non-national) ads for businesses and attractions within their coverage area. Find the address for a local business or restaurant mentioned in the ad and go to Radio-Locator and put in the zip code. Most likely you’ll find a match to the station in question. Traffic/Weather: More difficult to identify are signals in which you only hear a traffic or weather report. Often, you can glean a positive ID out of the signals based on an intersection, city/town name, or other information. A good tool to use to ID signals this way is the U.S. Numbered Highways website. Songs only/no formal ID: The hardest signals to identify are those where you only hear music. Often, a signal may fade away before you can hear an audible ID. Typically, I don’t log these music-only signals unless I hear something where I can positively ID it, as explained above. I’m only doing this hobby for myself, so I’m not gaining anything by falsely, or haphazardly, IDing a station I may not have, in fact, heard. There are exceptions, though. For example, there may be one station in the U.S. which broadcasts a comedy format on 105.3 FM and you are on that frequency hearing a comedy show. With enough supporting evidence (i.e. several other stations logged from the same region/state), I may consider this a log, but I’d note it as ‘area Es’ in my log to denote I didn’t hear a true ID from the signal. Webcasts/simulcasts: There is another exception to the ‘don’t log without ID’ rule. If you are getting stations from an isolated, geographically-specific area, such as central Kansas, and you find a station that is streaming its broadcast online and its webcast matches what you hear, I would likely consider it a positive log. Be careful that the station is not part of a radio network as mentioned before. Also make sure the station in question isn’t airing a syndicated radio program, like Delilah or Alice Cooper. Regardless, i’d note stations logged this way as ‘webcast match’ in my log to be safe. Please understand that some station networks (especially K-Love, NPR and similar networks) broadcast the same signal, with more than one station on the same frequency, so matching a signal you hear to a webcast doesn’t always give you a positive ID. Most likely, the only local ID is the station’s top-of-the-hour ID. For example, I have logged three “AFR” simulcast stations on 88.1 FM, one via Tr (WRIH Richmond, VA), and two via Es (KATG Athens, TX, KAPG Bentonville, AR). It is plausible to say that WRIH might be heard locally via Tr while Es is strong into TX/AR, so you can’t be quick to log an 88.1 AFR signal as KATG or KAPG unless you hear a local ID. Electronic means: There are ways of identifying radio stations without having to listen to an audible ID. RDS, or Radio Data System and HD Radio, otherwise known as In-Band-On-Channel (IBOC) are two methods of getting a positive ID from a digital text decode. RDS received from 96.9 KIAQ Clarion, IA at 925 miles on 6/4/08. RDS affords FM signals with the opportunity to broadcast a data stream, viewable on capable radios as a text display, along with its analog signal. It is entirely up to the station to decide what goes on their RDS stream. Most stations put the artist and title of the song currently playing in the stream, which is displayed on capable receivers. Others simply display their call letters, station phone number, or other station info. A benefit of RDS is that the station’s call letters can, theoretically, display immediately upon tuning the station. In the picture above, I logged 96.9 KIAQ Clarion, IA on 6/4/08 via Es simply by tuning in the station. The KIAQ calls displayed instantly on my radio’s screen and I was able to positively ID the station without having to listen for an audible ID. HD Radio/IBOC decode from 88.1 WUWF Pensacola, FL at 794 miles on 6/23/08. HD Radio, also known as “IBOC” (in-band, on-channel) has similar radiotext ID methods to RDS, but it is delivered in a different way. HD Radio allows stations to broadcast a digital signal within the 88.1 to 107.9 MHz FM band. Read more about the technicalities of HD Radio. These digital signals easily propagate via DX like analog signals, affording new opportunities for DXers to ID stations. When an IBOC signal is decoded, the station’s call letters appear on the radio’s screen, as seen in the picture to the right on 88.1 WUWF Pensacola, FL, received on 6/23/08 at 794 miles. This, like RDS, concludes a slam-dunk logging. Your radio is tricking you when it receives an HD Radio signal. For example, when I tune my radio to 104.1 FM, it decodes HD Radio from WPRS Waldorf, MD. However, in reality, WPRS broadcasts its digital sidebands on 103.9 and 104.3 FM. While you are tuned to WPRS, the radio picks up the sidebands and decodes it on 104.1 FM. In the above screenshot, note the rectangular “bands” surrounding the 104.1 analog signal from WPRS. Compare that to a station that does not (currently) broadcast HD Radio: WPGC 95.5 Morningside, MD (below). Note the absence of the two bands surrounding the center 95.5 analog frequency. HD Radio sidebands that “hug” the center frequency can often ruin DXing on those adjacent frequencies. For example, if you have a strong signal from 104.1 WPRS and can decode its IBOC, you will not receive anything on 103.9 or 104.3 on any radio. The static you hear on those two frequencies is an analog representation of the digital sidebands of WPRS. Strong DX can often overpower IBOC sidebands, however, which may be easy given the sidebands don’t broadcast at the same power as the analog signal. Alternatively, during intense tropo or sporadic E, you may get a neighboring frequency station’s IBOC right over another station’s sideband. For example, if you were on 103.9 FM during an intense opening, instead of getting nothing, you may get an HD Radio decode from a station on 103.9 over WPRS’ sideband, assuming the distant 103.9 FM’s 103.7 HD Radio sideband can be received by your radio. Click here to see my gallery of RDS and HD Radio screenshots from stations logged in Virginia. Of course, a radio that is RDS and/or IBOC-compatible is required to receive either service. HD Radios can typically also receive RDS from analog signals, but it isn’t always the same the other way around. Not all stations broadcast RDS and/or HD. Some run both services. Even in favorable reception conditions, RDS and/or HD may not be received even from stations known to be broadcasting them. unIDs: Finally, you may have enough to go on for a positive ID, however there are times when you simply cannot find enough information to log the station. Google might turn up no leads. Or, the station you logged is in another language than you speak and you can’t understand it to make an ID. When a station can’t be IDed, I’d highly suggest posting an audio clip of the logging on the WTFDA forums, along with date/time of the logging and other regions received (i.e. other states logged if received during an Es opening) to help narrow down where the signal is. I’ve frequently seen DXers who live by stations in question to confirm a log due to familiarity. In cases of clips in other languages, the WTFDA forums have Spanish and French-speaking DXers, among others, who can translate a clip for free. Most of my French Quebec FMs have been IDed with help from the friendly DXers at the WTFDA forums. After a station is identified, I would personally move on to the next frequency to see what else is coming in. Often, especially during Es openings, the time to DX is limited, as even strong, promising Es openings can collapse into oblivion with no warning. Staying on one frequency during a great opening after a positive ID limits the amount of time you have to DX other frequencies and, thus, highly limits the amount of potential new logs from the opening. If a particular frequency interests you, and you are able to record it on a separate radio, I’d suggest you do that and then go over the recordings at a later time, focusing your energy on getting new logs. January-March: Due to the cold weather in much of the United States, FM and TV DX is fairly uncommon. Look out unusually warm days or stalled high pressure weather fronts, as this may provide some interesting DX. AM Radio DX is at its peak at this time, so enjoy it while it lasts. March-April: The FM and TV bands open up for the southern portion of the United States, where temperatures are often already at summer levels. Those in the northern half of the U.S. may find occasional signal enhancement, usually accompanying a stalled weather front or weather inversion. AM DX is still good in the overnight hours, but not as good as during the winter. May: This is when things start to get fun for FM & TV DXers. Frequent stalled high pressure systems and weather inversions can bring in some unexpected and great FM & TV DX hundreds of miles away, usually during the evening, overnight, and late morning hours. Sporadic E also starts for the year in earnest, usually appearing toward the end of May with an occasional opening into FM. June-July: Hands down the best months for FM & TV DX. Sporadic E openings often happen multiple days in the middle of summer, often bringing in FM & TV signals thousands of miles away with all-day reception. All night tropo ducts with signals hundreds of miles away also keeps DXers busy, too. There’s often always something on the FM & TV dials during the summer to DX, but storms can temporarily dampen the effects. With all of the fun on the FM & TV bands, most DXers will likely forget about the AM radio at this time, because AM is a dud in the summer. August: Still a great time of year for FM & TV DXing with a continuation of the great summer tropo openings all month. Sporadic E usually bottoms out by early August, with minimal openings by mid-month. AM radio? Forget about it. September-October: The marathon DX openings heard in the summer months begin to quiet down, but some impressive tropo ducts can be heard throughout September and October as warm weather from the south creates stalled high pressure systems and inversions toward the north. Sporadic E is usually done for the year by this point. AM DX starts to get a little better, but not quite at its winter peak levels. November-January: Overall a mirror of January-March listed above, FM & TV DX slowly turns non-existent outside of the southern half of the country, while AM DX kicks off, bringing in strong signals from 100s of miles away. Although Sporadic E is unlikely during the colder months, a freak opening in December or early January is not unheard of. If you have the capability, I highly suggest recording every time you DX. Space is not an issue as you don’t need to keep uneventful DX, but you will have proof of receiving a distant station if you have it recorded. Recording DX audio doesn’t just help with the ability to replay old loggings. It also helps you ID stations you may have not heard the first time around. During intense Es openings, you may hear more than one ID at once on the same frequency, or upon replaying a DX recording, you could have missed a clear ID from a new station. I typically, during Es openings, am DXing two different radios simulateneously. I have both hooked up to my computer’s audio sound card (left audio from my Denon TU-1500RD radio, right audio from Sony XDR-F1HD radio) and set the computer to record in stereo. Using commercially-available audio editing programs, I can listen to one ‘side’ of the audio stream and pull out mono station IDs without interference from the second radio. I have detailed instructions as to what programs to use and computer settings for recording DX on the Recording DX Audio page. If you have visited most DXers’ websites, you will see that they often have more than one radio in their shack. My shack, pictured to the right, has two radios (on the upper shelf). Why is this, do you ask? It makes it very easier to log more stations during a DX opening if you can utilize two (or more) radios at the same time. During intense Es and Tr openings, I actively DX both the Denon TU-1500RD and Sony XDR-F1HD radios. As mentioned in the ‘Recording DX Audio’ section above, my two radios are connected to my computer sound card and my computer is set to record in stereo to get a synced ‘stream’ from both radios. While DXing, I use earbud headphones to DX. It may seem counter-intuitive to listen to two unrelated signals at the same time during Es. I admit, at first it is very awkward and confusing. However, training your brain to listen to two different audio sources at once maximizes the DX you can log. For example, during most Es openings, I put the Denon radio on 88.1 and tune up. At the same time, I put the Sony on 107.9 and tune down, trying to find the MUF of the Es opening. Often, I’m met with Es at 107.9 and I can DX both ends of the band at once, often logging many more stations at the same time than if I only used one radio. This is where having a paper DX log to jot down notes comes in handy–I can note the time and ID info and then listen to the audio later for clarification on potential new logs. As you may know, most of the time with DXing is waiting for a song to finish. When hearing two radios at once, you can train your brain to ‘tune out’ one station playing a song and then have it come back to your attention once the song is over for potential IDs. It also helps at the top of the hour to utilize two radios, as you may pick up two different, distant affiliates of the same radio network. In this instance, the audio on both radios should match except for local station breaks/IDs. Don’t worry, you can go back and pull out separate IDs from the audio recordings to ID each station. If you don’t like the idea of listening to two radios at once, you can focus on one radio and leave the second one to record frequencies active with Es, with you changing frequency on the second radio occasionally. I advise that this method may result in less stations logged overall, though, but it is better than just using one radio only. You will realize after DXing for a while that it becomes more difficult to log new stations. This often happens shortly after you log all of the regional Tr stations that typically come in your location. Don’t give up—there is always an opportunity to log more stations, depending on reception conditions. One night, you may log 15 new signals via Tr, while another day you log 40 new signals via Es. There are also many ways of logging stations right over your local FM stations. Logging when locals are off-air: Strong, local FM stations are often difficult, if not impossible, to ‘budge’ and allow another, more distant, signal to be received and logged on the same frequency. In some cases, with typical DXing, you may never log another station on the frequency of a local. However, there are ways of doing this. After a major storm or weather event, I’d do a dial scan. You may find a local FM signal is missing, and you may find a distant, new signal temporarily coming in instead. Be sure the storm has passed and you, as well as your DX equipment, are not in danger of harm before attempting to DX. On 6/23/08, a strong storm knocked local 93.3 WFLS Fredericksburg, VA off the air during an Es opening. As soon as WFLS disappeared, I logged 93.3 WNCV Shalimar, FL, at 779 miles. Local 104.1 WXGG Waldorf, MD, was off-air on 4/6/07 pending the sale of the station to another owner. Because of this, I was able to log 104.1 WAEB Allentown, PA, at 166 miles and WNNK Harrisburg, PA at 115 miles, both impossible to log otherwise due to WXGG’s strong signal at my home. Click on the player above to hear 104.1 WAEB heard with local WXGG off-air. It is hard to know when to check to see if stations are off-air, as I’ve found local stations off-air in the middle of the day, as well as in the middle of the night. All I can suggest is that you don’t skip past your local signals when DXing (assuming they are operational and on-air), as you might find the station is temporarily gone. You should also read into local station sales, signal move-ins, and other technical information found online, as many of these things could result in the affected station(s) signals going off-air for a while. As you can imagine, stations don’t advertise when they will be going off-air! Logging when locals are on low power: The same storm mentioned above on 6/23/08 that knocked 93.3 WFLS off-air also damaged the transmitter of local 98.7 WMZQ Washington, DC, according to DCRTV.com. HD Radio decode from 98.7 WNOR Norfolk on 6/23/08 while local WMZQ was on low power. WMZQ operated at low power for a few weeks following the storm, allowing 98.7 WNOR Norfolk, VA at 138 miles to come in over WMZQ, often with full RDS and HD Radio decodes, until WMZQ fixed its transmitter. Local signals that are on low power following a storm or other technical issue may come in weaker than usual on your radio. Use this to your advantage and see if there’s anything else out there that you can pick up and log. Turning the antenna to get stations over locals: This may seem simple, but during intense Tr and Es openings, logging a station on the same frequency as a local signal may be as easy as turning the antenna a certain way. Assuming you have a rooftop antenna on a rotor, you may get a distant FM by turning away from the local station. The presence of a second, strong distant FM signal on a frequency can often cause the local signal to succumb to the invading distant signal. If using an indoor radio, move the antenna in all directions and a null on the local signal may be achieved, allowing the distant signal to be heard. Click on the player above to hear 101.5 WRAL received over local 101.5 WBQB. I experienced a strong tropo opening into North Carolina on 6/26/08. While aiming my antenna away from local 101.5 WBQB Fredericksburg, VA at 24 miles to the NE, I noticed the station’s signal get staticy. Upon adjusting my antenna, I logged 101.5 WRAL Raleigh, NC, at 218 miles over WBQB. Interestingly enough, even though both WBQB and WRAL are to the south, I had to aim NE to allow WRAL’s signal to be strong enough to overtake WBQB. Unintentional new logs over local signals: You may find after DXing strong Es and Tr openings that distant stations will overpower local frequencies without any effort made on your part. For example, during an Es opening on 5/29/08, I received 99.1 KMAG Ft. Smith, AR at 992 miles, over local 99.1 WLZL Annapolis MD, which at the time had a Spanish format. KMAG broadcasted country, so I knew immediately I wasn’t listening to WLZL upon tuning. As seen in my DX log, most distant stations logged over locals were received ‘by accident.’ This is why it is imperative to not skip by local stations while doing DX dial scans. You never know when a far-away signal may overpower a local station. Phase box: I am personally not too familiar with this method, but a phase box, if used correctly with two antennas, allows you to null out a local signal and DX as if the local signal didn’t exist, making distant reception on the same frequency easy. As you can see, DXing is a highly-involved hobby involving receiving distant radio signals. Some DXers branch out to the amateur radio, TV and AM Radio bands, where DX is also just as commonly seen as with FM. Please contact me if you have any questions about DXing.